Common privet (Ligustrum vulgare) infestation. Federal Farm, June 14, 2012. Privet (Ligustrum spp.) is especially prevalent on the Federal Farm and O’Loughlin properties. Most of it is Eurasian common privet (L. vulgare), but there may also be some Japanese border or blunt-leaved privet (L. obtusifolioum subsp. obtusifolium) present. Both are considered invasive, but the Japanese species is highly invasive. These plants are considered to be semi-evergreen shrubs, but in this area the only leaves that usually remain in place through the winter are those that are protected by snow near ground level. 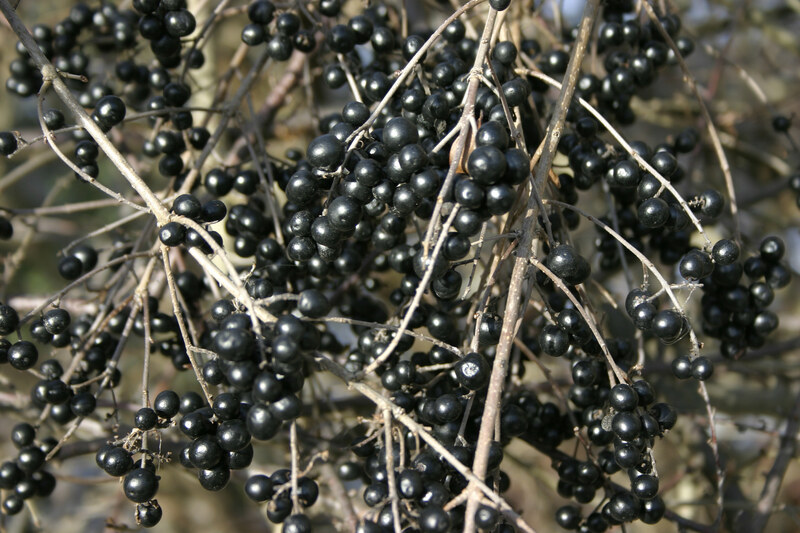 However, their black fruit often survives the winter high up off the ground, where it is eaten by birds, which then excrete the seeds at another location (a good reason to keep privet hedges well trimmed if they are planted). 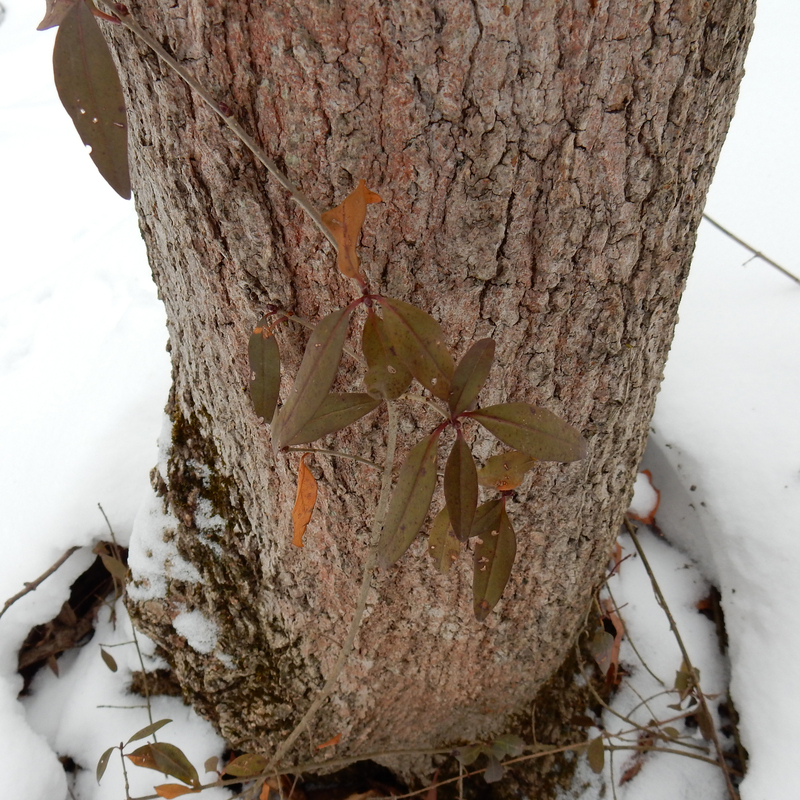 Privet leaves at the base of a Scots pine, December 21, 2014. No privet species are native to North America, but since about 1800, privets have been planted here as hedges, and when allowed to naturalize, they form dense thickets that prevent native plants from surviving and make it difficult for large animals (including humans) to pass through. Like other plants praised for their living-fence qualities, privets re-root where their branches touch the ground. This not only causes the problem of new privet clones being created, it also creates a tripping hazard because the branch is then firmly rooted at both ends. This problem is especially noticeable at the upper part of the O’Loughlin property, where privets fill the understory of the wooded areas and insist on crossing and recrossing the trails, making them difficult to maintain, even where there is not enough sunlight for the privet to reach much of a height or produce many seeds. Common privet fruit peristing into the spring.Federal Farm. April 4, 2011. 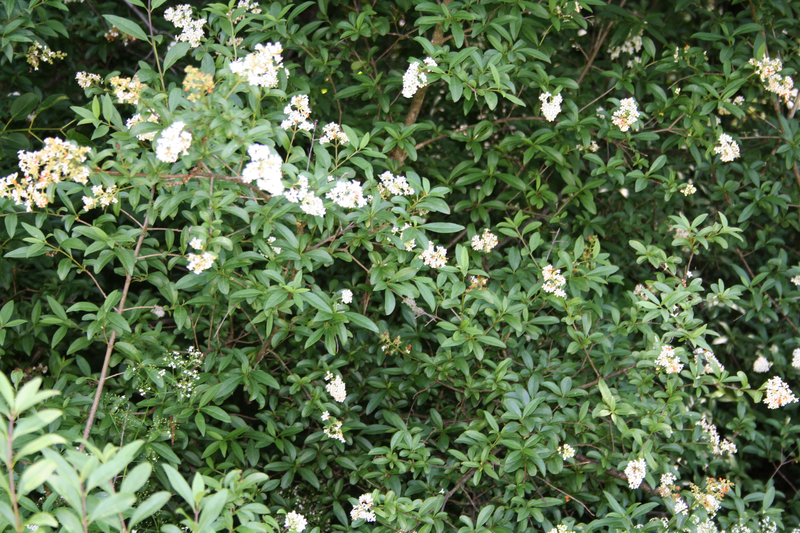 In other areas, like along the wider north-south trails of the Federal Farm, privet reaches ten feet high or more, producing numerous small fragrant white flowers during the summer and then bunches of black fruit in the fall. So there is some beauty to be found in naturalized exotic plants like privet, but besides the ecological harm that they cause, there is also an aesthetic loss which is arguably greater than any beauty that they introduce. Most of the introduced understory plants like privet, honeysuckle and buckthorn have the characteristics that they leaf out early in the spring, densely fill any voids in the summer, and then their leaves remain green while native vegetation is going through its fall color changes. So besides the fact that diverse native plants are being replaced (or prevented from getting started), their seasonal changes are often blocked from view by the exotic plants that thrive on the forest edges.